Proving that the angles inside a triangle – any triangle – sum up to 180° is very simple, but leaves most people unsatisfied (or unconvinced) because it depends on the properties of something called Alternate Interior Angles. A demonstration of the angles of a triangle summing up to 180° can be found here. Given any triangle, how can you prove that the angles inside a triangle sum up to 180°? It is easiest to draw the triangle with one edge parallel to the horizontal axis, but you don’t have to because this proof works regardless of the orientation of the triangle. Rotating a triangle does not change its properties. 3) We know by Alternate Interior Angles that angle D must be the same as angle A and angle E must be the same as angle C.
This proof depends on something called Alternate Interior Angles – which makes the proof trivial, but unsatisfying for most people because it is not one of those “facts” we carry around with us. In fact, pulling out Alternate Interior Angles makes it look like a lot of mathematics is just made up on the spot. Alternate Interior Angles isn’t pulled out of thin air and it is a fundamental part of geometry. For a proof of Alternate Interior Angles, see this page. 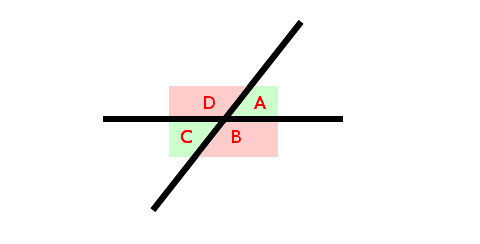 It happens that angles A and C are identical and angles B and D are identical. 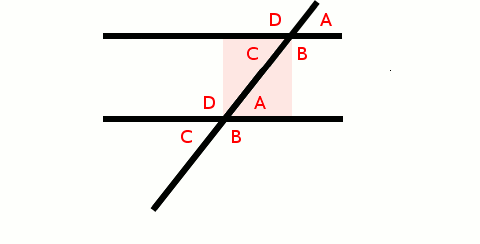 If we move one of the lines so it remains parallel to its original position (in math-speak, this is called translation), what happens to the angles? Nothing. The angles remain the same. It doesn’t matter where the two lines intersect (cross). Only the angle of intersection matters. 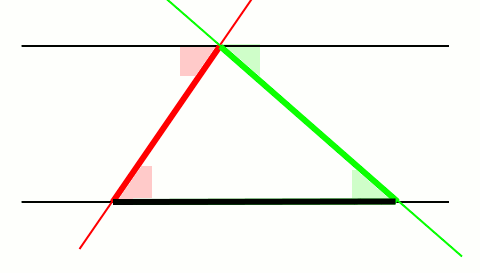 We call the angles between the parallel lines interior angles because they are inside (in between) the parallel lines. 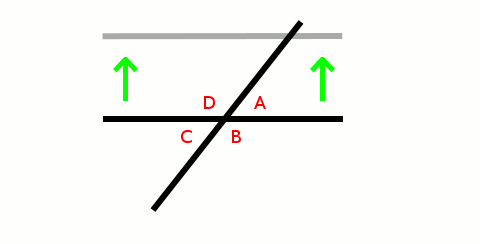 We notice that the angles on opposite sides of the transversal (math-speak for the line that intersects (crosses) the parallel lines) are the same. We say the angles on alternate sides of the line are identical. 1) the base of the triangle forms one of the parallel lines and we draw the second. 2) each of the sides of the triangle acts like a transversal intersecting the parallel lines.